Frances’ sister was outside when the murder took place and heard noises, bringing her inside. When she saw her sister on the floor covered in blood, she ran to a neighbor for assistance. 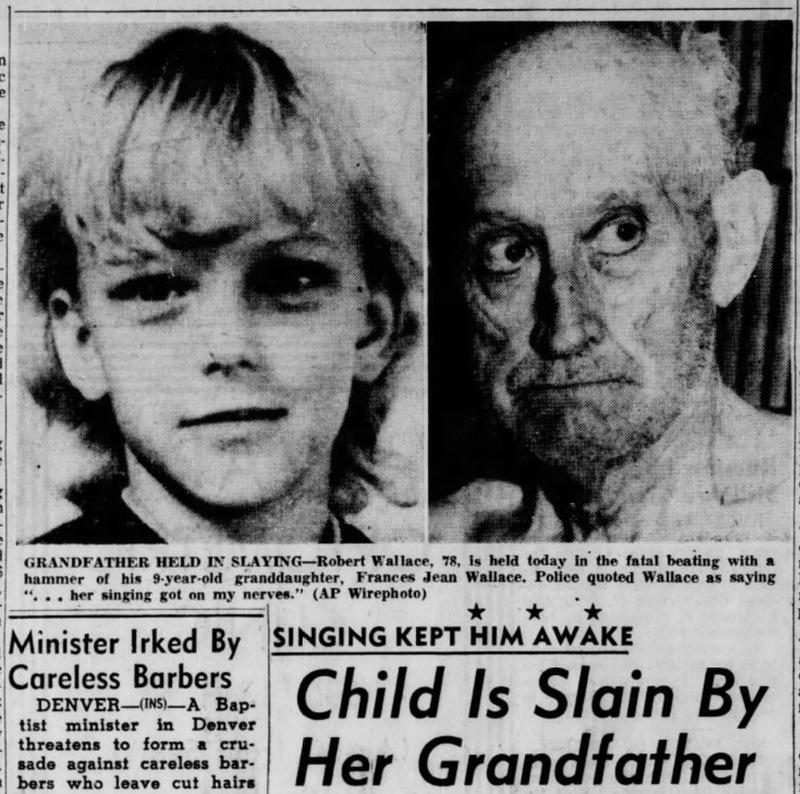 The neighbor, finding Robert calmly rocking in a chair, asked what happened to which he replied, “nothing, I just killed her.” Frances was struck in the head approximately 20 times. Robert’s recorded life following this article is patchy. On August 30, he waived his preliminary hearing and was to be evaluated by psychiatrists to determine his level of sanity and ability to stand trial. In November of 1955 Robert was indicted and in December he was admitted to the hospital for hardened arteries. I found death certificate for a John Robert Wallace who was the same age as Robert J. Wallace, buried in the same cemetery as Frances, dated February 2, 1957. The death certificate also mentions the deceased suffered “chronic brain syndrome asso. with cerebral arteriosclerosis with psychotic reaction” and appears to be the murderer in question. If he spent his final days in a hospital or in a prison, I do not know however.